Geology of meteorites and the early Solar System : where do achondrites come from, and why most of them missing? In my last presentation, we looked at how meteorites can be divided into chondrites and the rest, and how the most primitive chondrites that fall to Earth today still retain the chemical composition of the primordial Solar Nebula that the Solar System originally formed from. We also saw how chondritic material in the primordial Solar Nebula accreted together to form larger lumps that we now call “asteroids” that continued to accrete to form the rocky planets that form the inner Solar System, including planet Earth. Here we'll look at the rest of the meteorites and see how well they fit this story of planetary and asteroidal evolution. There’s still an awful lot we don’t understand about meteorites ! The “rest” of the meteorites are called “achondrites” (i.e. not chondrites), traditionally divided into “stones”, “irons” and “stony-irons”. Let’s look at the “stones” first. Basically, these are what we on Earth would simply call “rocks”. The general idea is that they were once chondrites that were heated up and melted, but how does this kind of thing happen ? Heat is produced in rocks by radioactive elements such as uranium, thorium and potassium that decay into things like lead and argon, and in doing so they give off heat - just like a nuclear reactor. lGeologically, the melting of rocks is a very strange process. Let me explain. lIce is solid water. When it melts, we get liquid water, but rocks don’t behave this way. We know that Venus and Mars are differentiated planets with crusts made from volcanic basalt lavas, similar to the composition of the ocean floors on Earth. So, lets looks at where this basalt lava comes from. Well - and this is the weird reality of the geology of melting - basalt is made of two minerals called feldspar and pyroxene, and it’s the product of the partial melting of a third mineral called olivine. Partial melting means you don’t melt all of the olivine, just part of it. In other words, if you partially melt one thing, the melt you get is another composition entirely : strange, but true ! But the geology of magmas or melts is just as weird when it comes time for them to cool down and crystallise. If you let a magma cool slowly, instead of forming one kind of rock, it forms a whole family of different rocks at different temperatures. 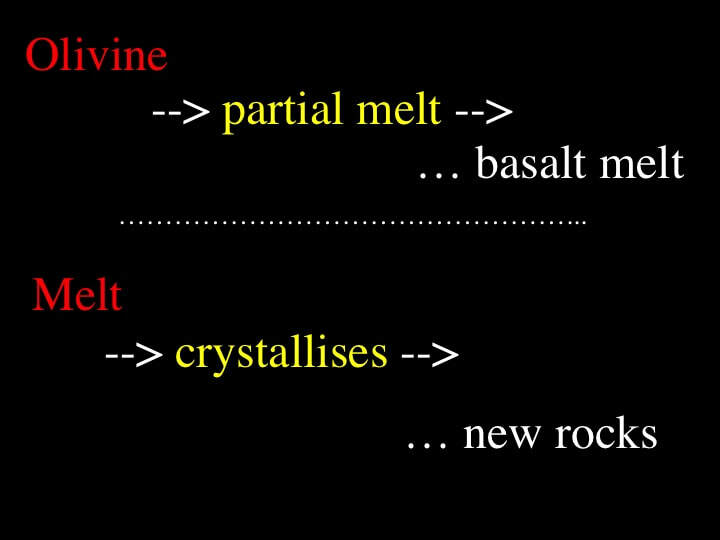 What all this means is that if you start with one mineral - say olivine - and you melt it progressively, then remove and let the melt cool progressively, you end up with a variety of rocks - from basalt to "granite" ! … and this is how chondrites differentiate into the host of different rocks that the rocky planets are made of. So what does the average differentiated rocky planet look like ? Well, for a start, it has an outer crust of basalt that’s made of the minerals feldspar and pyroxene - and a core that’s made of iron and nickel sulphides. In between the two is a thick mantle that’s mostly made of the mineral olivine that makes rocks such as dunite and peridotite, for those of you familiar with those names. Don’t worry if these rock names are strange : the only point I’m making here is that homogeneous chondrite bodies heat up and melt, then cool and crystallise to form differentiated planets or large asteroids that are made of a whole slew of different rocks. Sounds pretty straight-forward, doesn’t it ? However, let’s have another look at those achondrite meteorites and see how well they fit this picture of planetary evolution. According to the story I’ve just told you, some meteorites should look like planetary crust : these are called eucrites, and they are simply basalts. Another kind is called diogenite, and these have the same mineral composition as the rocks that form the top of the Earth’s mantle, just beneath its crust : hypersthene orthopyroxenites for those of you who need to know. Another kind, called howardites (makes you really wonder where they get these names from !) 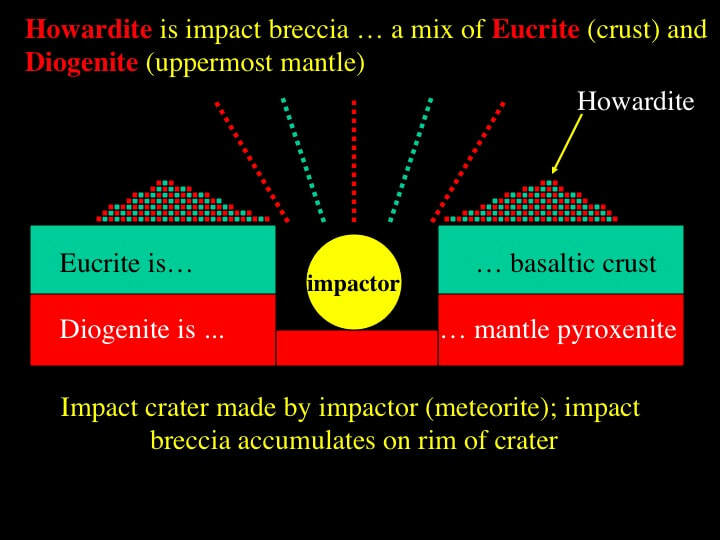 are mixtures of eucrite and diogenite that form when large impacts occur on differentiated asteroids or planets that breach the crust through to the upper mantle, resulting in a mixture of fragments of the crust and mantle rocks to form what’s called a breccia. Believe it or not, but this process is technically referred to as “gardening”. The point here is that these meteorites support the idea of differentiation of initially chondritic bodies during the accretionary phase of the evolution of the Solar System, and it all makes good geological sense ! So much for stones. What about other achondrite meteorites ? Iron meteorites are made of Ni-Fe alloys, which is what planetary geologists think most rocky planets have at their cores. Pallasites, probably the best known stony irons, are mixtures of olivine and Fe-Ni alloys that represent a mixed melt derived from the lowermost part of a differentiated mantle and the uppermost part of a differentiated core (think : oil and water). Again, all this makes perfect sense in terms of a model of differentiated asteroidal or planetary bodies. However, in focusing on these particular meteorites that make sense, we are missing the wood for the trees ! In order for irons to turn up in the meteorite population that falls to Earth, you have to breakup large differentiated planetary bodies. However, we’ve just seen that the bulk of a differentiated planet is made up of an olivine-rich mantle. Where are the meteorites from the differentiated mantles that should be made of the mineral olivine ? Proportionally, these should form the majority of meteorites according to our differentiation story. There are some - called brachinites - but they are very rare, and this is probably the greatest conundrum facing meteoriticists today. Where are the differentiated mantle meteorites ? This looks like a pretty major hiccup for the simple accretionary and differentiation theory, so let’s look and see if there are any other problems with meteorites while we’re at it. Well, when you look a bit more closely at chondrules in chondrites, there are a few problems there too. Remember what chondrules are supposed to be. Interplanetary dust-balls that were flash-melted and rapidly frozen during the development of the very early stages of the primordial Solar Nebula. However, a very common kind of chondrule is called “porphyritic”, which means that it contains large, well formed crystals of olivine or pyroxene that are interpreted to represent crystals that had formed prior to the flash-melting event that formed the chondrules themselves. lWhy is this a problem ? Because well formed crystals of olivine and pyroxene only form in large volumes of melt, 100’s of metres thick at the very least, that cool very slowly, giving the crystals time to grow to a large size - and the only place this could occur is inside a relatively large asteroid or planetary body. The fact that these crystals turn up inside chondrules means that some chondrite meteorites are not all that primitive after all : some chondrules were still able to form in the Solar Nebula after relatively large asteroids had already formed and begun to melt internally. However, I still don’t understand how you extract the well formed crystals from the differentiated asteroids. Impacts are the obvious method, but this would have have shattered the olivine and pyroxene crystals because of the tremendous force that impacts involve, and this does not appear to be the case in the published images I’ve seen. Another weird observation is the presence of inclusions that occur in carbonaceous chondrites, that’s to say chondrites with a fair bit of carbon in them. These inclusions are called CAI’s, which stands for Calcium Aluminium Inclusions. Many of these inclusions are pretty unremarkable, like pyroxenes and feldspars, but others are spinel and perovskite. On Earth, the only place we find pervoskite* is in lumps brought up in volcanic pipes from deep within the Earth’s mantle, but as we saw last time, carbonaceous chondrites are the most primitive kind of meteorite, and in theory they’ve never been involved in the differentiation of large asteroids or rocky planets. So, where did the perovskite come from ? Quite honestly … no-one knows ! * What I didn't appreciate at the time of this presentation is that perovskite is a mineral structure, as opposed to a composition, and it is not only pressure sensitive, but temperature sensitive too. lOK - that’s enough ! There’s lots more that bugs me as a geologist when I read about meteorites, but I think I’ve “bombarded” you (forgive the pun!) with more than enough details already. The bottom line here is that there’s a great deal about meteorites - and what they can tell us about the formation of the primordial Solar System - that we simply still do not understand. Well, this is all very nice, but what about observing these “left-overs from the accretionary process” that appears to have dominated the early history of our Solar Nebula ? What can we as amateur astronomers observe through our telescopes that relates to where meteorites come from ? 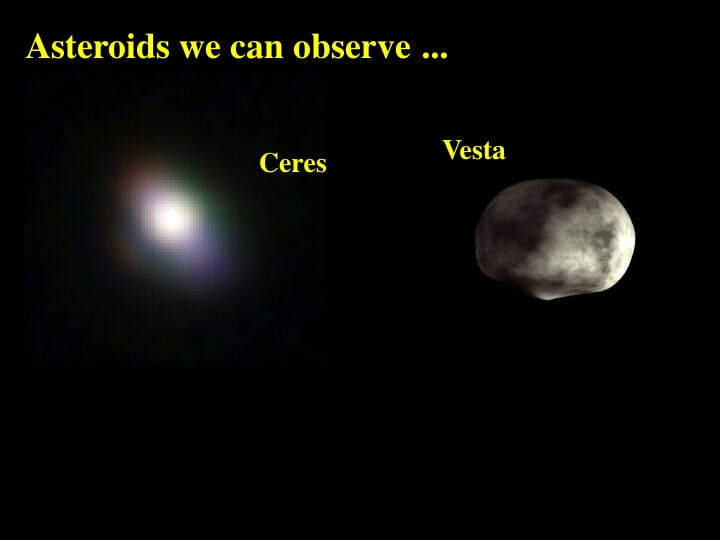 Lets just look at a few asteroid examples. Ceres, the largest and first asteroid discovered, is made of primitive carbonaceous chondrite. So much for large asteroids heating up, melting and differentiating ! Vesta, on the other hand - second largest asteroid - has a eucritic or basaltic crust and appears to be the type example of a differentiated asteroid with a crust, and mantle and maybe a core. Pallas - contrary to what you might imagine - is not made of pallasite at all, but is composed of carbonaceous chondrite ! It turns out that the asteroid is named after a classical Greek, while the meteorite is named after a certain Mr Pallas !